"Let the Land rejoice, for you have bought Louisiana for a Song." The Louisiana Purchase is considered the greatest real estate deal in history. On April 30, 1803, the United States paid France $15 million for the Louisiana Territory. For approximately four cents an acre, the U.S. gained 828,000 square miles of land west of the Mississippi River. The lands acquired stretched from the Mississippi River to the Rocky Mountains and from the Gulf of Mexico to the Canadian border. Thirteen states were carved from the Louisiana Territory. The Louisiana Purchase consists of three separate agreements between the United States and France: a treaty of cession and two agreements providing for the exchange of monies in the transaction. The Louisiana Purchase, commonly called the Louisiana Purchase Agreement, had doubled the size of the United States, making it one of the largest nations in the world. The inexpensive transfer of such vast amounts of territory, without war or threats of bloodshed, also made the Louisiana Purchase one of the most lucrative deals in history. By signing the Louisiana Purchase Treaty in Paris on April 30, 1803, Robert Livingston and James Monroe had closed on the grandest real estate deal in the young nation's existence. They were authorized to pay France up to $10 million for the port of New Orleans and the Floridas, but when offered the entire territory of Louisiana—an area larger than Great Britain, France, Germany, Italy, Spain and Portugal combined—the American negotiators swiftly agreed to a price of $15 million. Although President Thomas Jefferson was a strict interpreter of the Constitution who wondered if the U.S. Government was authorized to acquire new territory, he was also a visionary who dreamed of an “empire for liberty” that would stretch across the entire continent. As Napoleon threatened to take back the offer, Jefferson squelched whatever doubts he had and prepared to occupy a land of unimaginable riches. 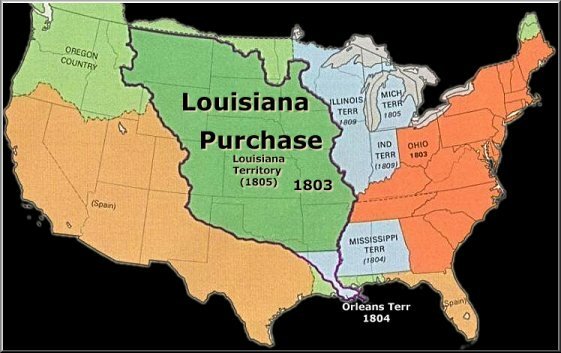 The Louisiana Purchase Agreement, or Vente de la Louisiane, consisted of the Treaty of Cession and the two conventions regarding the financial aspects of the transaction. As a signature achievement of Thomas Jefferson, the Louisiana Purchase Agreement between France and the United States had enlarged the U.S. by 828,000 square miles of land west of the Mississippi River. For $15 million, roughly 4 cents per acre, the nation had doubled its size, but with the real estate sequel just 45 years later, the United States would alas extend its borders from sea to shining sea. Thomas Jefferson, who was the author of the Declaration of Independence and founder of the University of Virginia, had indeed created a precedent for future administrations with the controversial purchase in 1803. The Mexican Cession, which was signed on February 2, 1848, was a Treaty between the United States and Mexico that ended the Mexican-American War. For a payment of $15,000,000, the United States received from Mexico more than 525,000 square miles of land, which form the present-day states of Arizona, California, Nevada, New Mexico, Texas, and Utah. and portions of the states of Oklahoma, Colorado, Kansas, and Wyoming. From the signing of the Declaration of Independence on July 4, 1776, the fledgling 13 Colonies had expanded westward and from sea to shining sea in merely 72 years, and by doing so it had henceforth removed the presence of the world powers of England, Spain, and France. But it all began with Thomas Jefferson's vision and the Louisiana Purchase Agreement in 1803.